Aqua Adventures offers a two location snorkel tour for the ultimate ocean experience. For the first stop, it is normally Molokini and Turtle Arches for the second). Take your snorkeling experience to a whole new level of underwater thrills with a SNUBA DIVE. While SNUBA is Aqua Adventures’ specialty, this boat is great for those who are only going to snorkel too. The Pride of Maui Molokini has a glass-bottom viewing, water slide, continental breakfast, a BBQ lunch, and an open bar. This vessel is spacious and stable with her sprawling upper deck features panoramic viewing and outstanding photo opportunities of the Maui coast and surrounding islands. Typically the first stop is Molokini Crater, which boasts clear waters and an array of sealife. 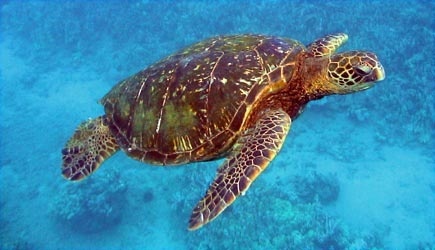 Next you’ll go to “Turtle Town” where you can swim with Hawaiian green sea turtles! 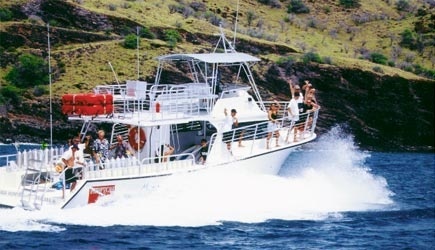 Fourwinds Molokini tour is fondly referred to as “the boat for fun-lovers”. 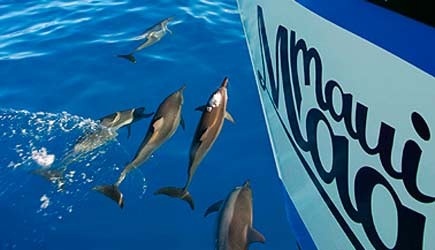 Aboard the 55 foot glass bottom catamaran, you’ll see why vistors consider this trip to be one of the best to Molokini and why we have become a local favorite too. 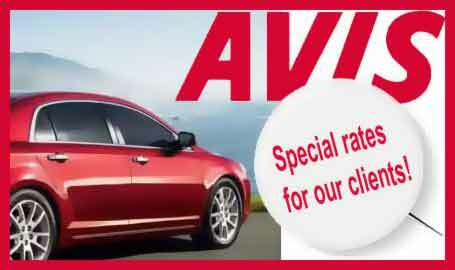 The crew is dedicated to your needs and providing you absolute fun. This adventure is a family favorite, and offers something for all ages. 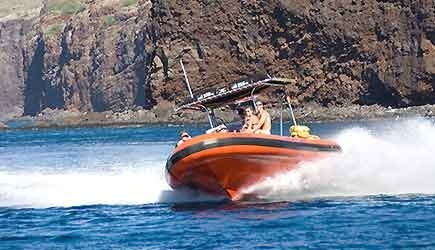 The Fourwinds’ one destination is Molokini, and you will spend more time at Molokini than any other boat. For those who are staying in a resort at Wailea, Makena, or one of the South Kihei condo properties, Blue Water Rafting offers a great alternative. They havefour different tours, three of which go to Molokini crater. These adventure packed tours operated on a 24 passenger zodiac raft. Maui Magic Molokini and Beyond tour is for the adventurer that likes the wind in your hair, seeing dolphins in the wild, and the thrill of discovering different side of Maui’s beauty. You will ride a state-of-the-art, fast, comfortable, power catamaran equipped with BBQ grills, on board waterslide, and an awesome sound system. As you cruise along the coastline, your captain will provide a complete Hawaiian historical and cultural narration. The privately-owned island of Lanai lies nine miles across the Au’au channel from West Maui. It doesn’t have the lush landscape found in Maui’s jungles, but Lanai has the longest stretch of coral reef in Hawaii and the beaches on this island are deserted. Experience uncrowded beaches, tidepools, snorkeling, red seacliffs, and lots of sun. Spinner Dolphins are seen frequently on Lanai’s southern coast! 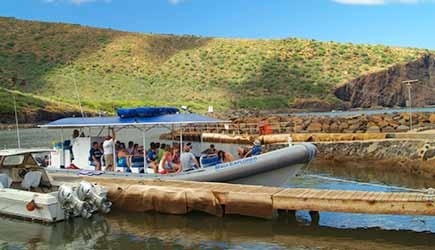 Ocean riders is one of the only tour operators that consistently circumnavigates the entire island of Lanai year-round. Typically, you will see shipwrecks strewn along the north shore of Lanai, and you have the opportunity to swim in and walk around on an isolated and remote beach. Explore sea caves carved out of the cliffs by giant storm swells over the centuries. Gaze upon the cliffs of the Kona Coast of Lanai, and see Shark Fin, one of our favorite snorkel spots in Hawaii and one of the few places where pyramid butterfly fish can be seen. 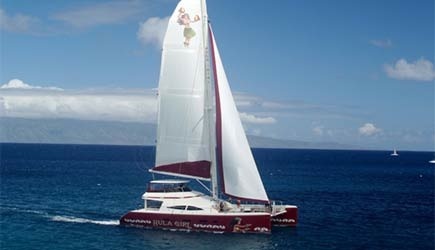 The state-of-the-art 65′ Hula Girl is Maui’s newest and most luxurious sailing catamaran. 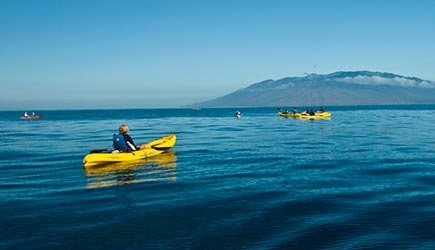 For their premium 5 hour snorkel tour, there are daily morning departures right from Kaanapali beach. Cruise along the West Maui coastline to unforgettable snorkeling locations such as Honolua Bay Marine Preserve. Dive platforms at the stern and a wide stairway between the bows provides easy access to the underwater world This vessel is equipped with a full commercial kitchen, food and drinks are ordered a la carte off their menu and prepared to order. 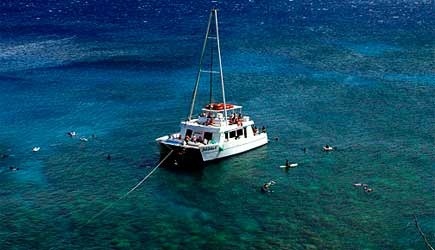 Departing directly from Kaanapali Beach, Teralani Snorkel Sail charters offers two tours that aboard beautiful 65′ x 35′ sailing catamarans. It is equipped with a covered salon and bar, indoor and outdoor seating, two spacious restrooms and fresh water showers. You will experience two of the best snorkeling spots (locations vary depending on weather and sea conditions). If you’re feeling adventurous, snuba is an on board option. Explore the amazing underwater world, then sit back and enjoy the views as you sail back along the scenic west Maui coast to Ka‘anapali. 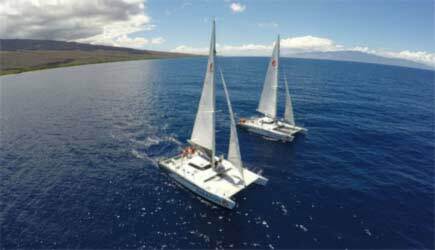 If you’re looking for an exhilirating sailing advenutre that includes world class snorkeling, Paragon Sail Maui does it best! They have two high performance catamarans, Paragon & Paragon II. They charter to Molokini, Coral Gardens, Lana’i, and Lahaina sunset sailing. 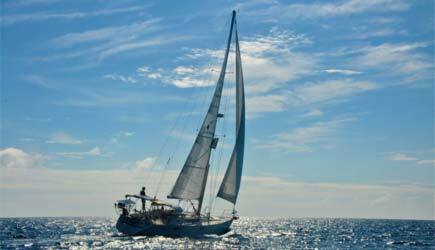 Paragon sailing offers the most exciting sailing and snorkeling. 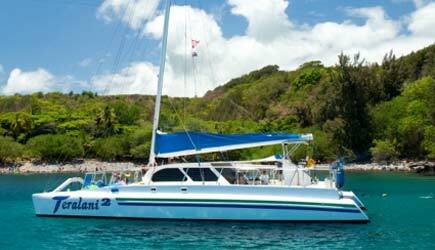 The vessels focus on sailing, and only go to one snorkel destination per trip. 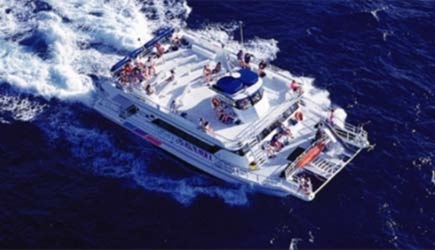 They depart from Lahaina Harbor or Ma’alaea Harbor depending on your tour choice. 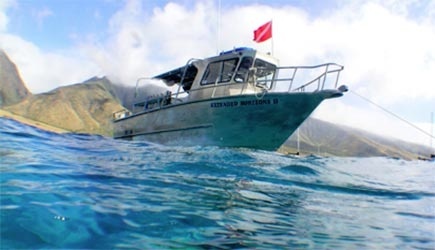 Molokini scuba on Maui Diamond offers Molokini and Turtle Town dive trips for both certified and introductory divers. You can still go diving with them if you’re not certified! For certified divers, two tank scuba is included. 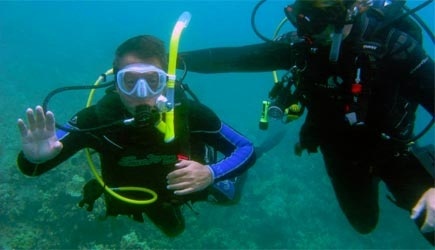 Dive sites vary based on weather, diver experience levels, and special requests. Certified divers go in a different “pod” and do two dives in the 60-70 foot range: the typical locations are Molokini and Turtle Town. Lanai scuba is the ultimate diver’s adventure. You will explore the Cathedrals, a volcanic grotto that is two stories tall inside, and the light coming in through the numerous openings creates a supernatural effect. Keep a lookout for lobster, nudibranchs, eels, dolphins, manta rays, eagle rays and the white tip sharks that frequent the area. A second dive spot will be chosen on the day of your tour – very often one of the turtle hang-outs is a popular choice. There are also night dives available, and these are shore dives done at various locations along Maui’s west coast. Discover a unique side of Maui as you paddle the stunning coastlines and pristine tropical waters teaming with sealife and coral reefs. South Pacific Kayaks has the island’s best guides and equipment. All South Pacific kayak guides are CPR and first aid trained for your safety and security. The knowledge and experienced guides treat each guest with professionalism and a true aloha spirit. There are four different adventure and fun filled snorkeling tours to choose from. No Hawaiian vacation is complete without swimming with the Hawaiian green sea turtles also known as honu. They are an important part of the ocean environment. Their shells range from an olive brown to black in color, and they can grow between 200-500 pounds. Green sea turtles primary diet is algae, so you will see them nibbling along coral and rocks. Depending on what kind of day you’d like, we’ve got 4 turtle snorkels to choose from! Customize your day on the Hawaiian waters and escape the crowds with one of these private charters. Where you want to go, what time you want to depart, what you want to do… the choice is yours! You will have a personal captain and crew at your disposal. 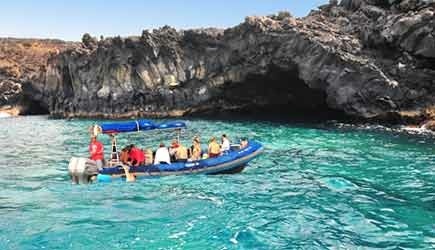 Zodiac into sea caves, sunset sails, powerboat to the best snorkel destinations…we have the boat for you!